When considering which charity to support throughout 2017 and beyond, the members of the Paignton Ward in Devon decided that they wanted to help an organisation called Torquay Community Larder, which is based at Torquay Salvation Army. The Community Larder is a multi-faith operation that provides emergency food for those in need, under a referral system. Torquay Community Larder has plans to develop other welfare support, such as money management courses and employability skills training. It is hoped that these more sustainable welfare support solutions will begin to have some impact on the root causes of food poverty rather than inadvertently creating a culture of ‘dependency’ solely around food. Members of the Church in the Paignton Ward have been enthusiastically donating tinned foods, potatoes, meats, fruit, beans, vegetables, soups, jams, sauces, long-life milk, pasta, rice and hygiene products. 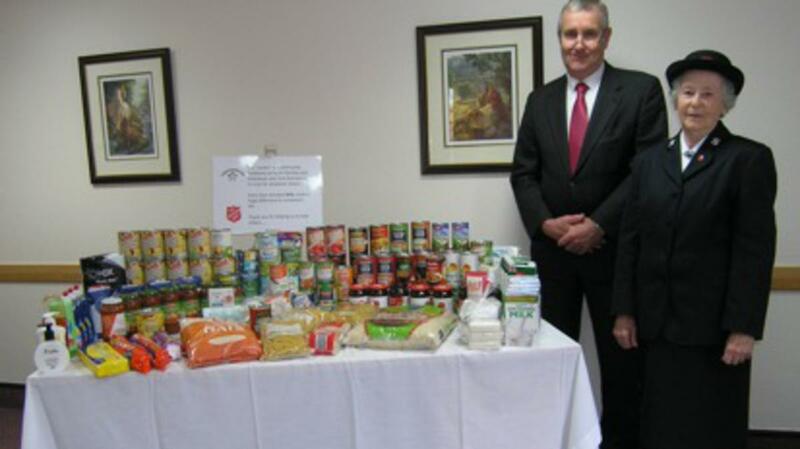 Bishop Schofield met with Mrs Marion Hill of the Salvation Army to hand over the collection of food and hygiene products that had been donated. Paignton members feel this is a really important project to be involved in, as more and more people are finding themselves struggling financially. They have a strong desire to help as much as they can and feel privileged to be able to work with other churches under the direction of the Salvation Army in order to help meet this local need.